In recent weeks more than 90 students of IE Business School’s International MBA program have been examining the challenges and opportunities brought by blockchain to the corporate world. 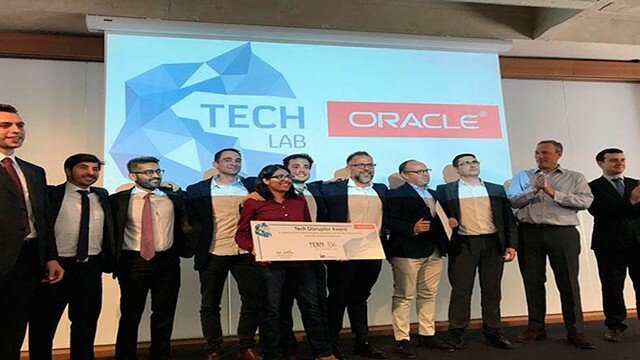 The students undertook this particular learning process as part of the first edition of TechLab, an educational program run in collaboration with Oracle that now forms part of IE’s International MBA program. Over the course of five weeks the students learnt from technology experts about blockchain’s potential in sectors like retail, banking, insurance, tourism and telecommunications. They enjoyed learning by means of tech bites focused on fields like artificial intelligence, big data, Internet of Things, quantum computing and robotics. Students attended workshops on tech foresight, centered around the future of technology from a strategic perspective, and worked on design thinking. They also developed management methodologies used to apply technology to businesses and analyzed the impact of technological change on business organizations. 1. Overall Winner and Best Project in the Field of Retail Sector: Project aimed at producing formulas to increase traceability and transparency in a large supermarket group’s supply chain of food. 2. Finalist and Best Project in the Field of Telecommunications: Project aimed at creating an ecosystem out of the businesses and private clients of a telephone firm by bringing them together using a blockchain network in order for them to enjoy the exchange and consumption of services through collaborative economy techniques. 3. Best Project in the Field of Tourism: Project aimed at creating value for Spain’s Ministry of Energy, Tourism and the Digital Agenda by using blockchain to streamline tax refunds to visitors from abroad. 4. Best Project in the Field of Insurance. Project aimed at adapting the Price of insurance policies to each driver’s profile by using a blockchain network to combine information on sensors installed in the vehicle and data available on the TIREA platform. 5. Best Project in the Field of Banking. Project aimed at creating an ICO (Initial Coin Offerings) formula with the support of an interbank blockchain network.